The 1989 Portuguese Grand Prix (formally the XXIII Grande Premio de Portugal) was a Formula One motor race held at the Autódromo do Estoril in Estoril, Portugal on 24 September 1989. The 71-lap race was the thirteenth of the 1989 Formula One season. 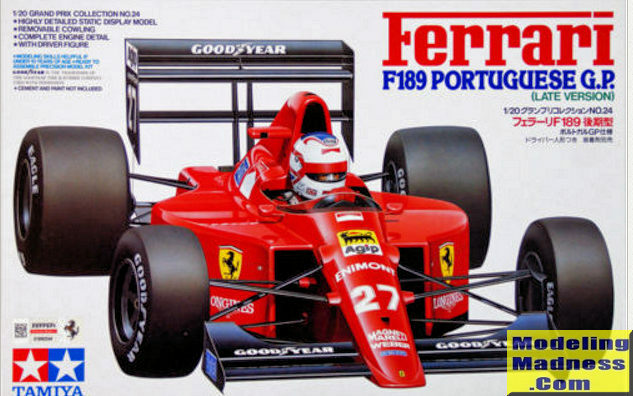 It was won by Gerhard Berger to take his first, and only, victory of the season for Ferrari. Alain Prost finished in second place for McLaren, strengthening his championship chances after his team-mate and rival Ayrton Senna had been involved in a collision with Ferrari driver Nigel Mansell which resulted in them both retiring. Mansell had just been black flagged at the time of incident for reversing back into his pit box after overshooting it during a stop. The podium was completed by Stefan Johansson, who took both his last and Onyx's only podium, and also Onyx's last points. 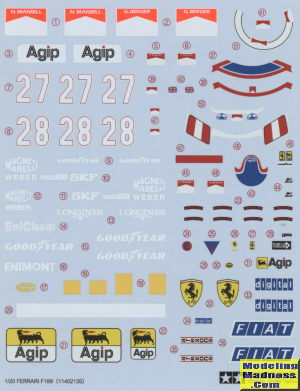 As is the norm with Tamiya F.1 kits, it is molded in a variety of colors. We have red for most of the body parts, black for the chassis, wheels, suspension and most of the engine as well as the driver's compartment. The driver figure is in while and there is a smoked sprue for the helmet visor and the small windscreen. Tires are rubber/vinyl and there are metal screws to hold the wheels in place. Normally, one would build the engine, transmission and rear suspension pieces first and this one is no exception. Thanks to the lack of turbocharging, thereis not the mass of piping and coolers that you'd have with those types of cars. The cockpit tub is a single piece onto which one attaches suspension members and the side mounted radiators. There is belt detail molded onto the seat, which I find a nice touch or one can install the driver figure. The arms can be attached either turning the wheel to the left or straight ahead. With most of the interior done, this is then placed atop the pan and the side pods and engine assembly are attached. Wheels are screwed in place using a provided tool and the upper body shell is attached after building up the front wing. Last bits are the rear wing and the head for the driver. Instructions are well done with notes in several languages. Markings are for either Mansell or Berger and the instructions show you the differences in markings for those two. Aside from black on the wings, wheels, and lower tray, everything else is red, so no complex masking as with some other schemes. All paints listed are from the Tamiya line. It also means a pretty basic decal sheet. Decals are nicely printed and should work just great. Not shown are dry transfer markings for the tire logos. If I were going to suggest a first 1/20 F.1 kit, this would be a good one. The kit is complex enough to satisfy, yet does not require a lot of fussy painting. My limited experience with Tamiya F.1 kits has shown them to be excellent builds that result in very nice models. The older kits like this are inexpensive even when new78, reissued with some frequency, and are easy to find on the second hand market.